According to the facial feedback hypothesis, facial muscles do not only express emotions, they also have the ability to modulate subjective experiences of emotions and to initiate emotions. This study examined the voluntary facial action technique, where participants were instructed to react with the Zygomatic major muscle (smile) or the Corrugator supercilii muscle (frown) when exposed to different stimuli. The results demonstrate that the technique effectively induces facial feedback effects. 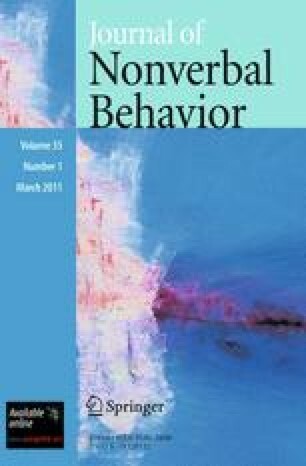 Through use of this technique we further addressed three important areas of facial feedback and found, first, that facial feedback did not modulate the experience of positive and negative emotion evoking stimuli differently. Second, the modulating ability provided significant feedback effects, while the initiating ability did not. Third, an effect of feedback remained and could be detected even some time after the critical manipulation. It is concluded that the present technique can be used in the future study of facial feedback. This study was supported by grants to Ulf Dimberg from The Swedish Research Council and The Bank of Sweden Tercentenary Foundation. We thank Monika Thunberg for helpful comments on the manuscript.